The foundation is the supporting part of the building and is designed to transfer the load from the structures located on it to the base, that is, on (the ground). From the reliability and strength of the foundations depend on the operational quality of the building, and of course the durability of its use. 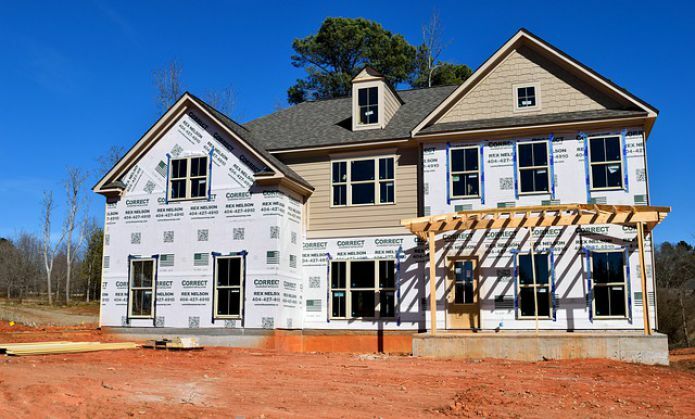 The cost of construction (foundations can be up to 40% of the cost of the house itself, but the correction of mistakes made, as a rule, is very labor-intensive and expensive, so the construction of the foundation should be treated very responsibly. The soil, located under the foundation, and carrying the load of the weight of the house and the foundation itself, called the base. Bases under any buildings and structures can be of two types - natural and artificial. The grounds on which the foundation is laid without any additional reinforcement are considered natural. An artificial base is one that is strengthened, for example, with the help of a sand bedding (sand pad), rubble or other material, followed by tamping. Natural bases can be of the following types: sand with various sizes of sand, clay, loess-like (silt-clay soil), rock, loam and sandy loam. Different soils (with the exception of rocky) give a different draft of the house. With an uneven draft, cracks occur in the walls. Gravel grounds (gravel, stone breaks) are strong enough, they are not washed out and are not compressed. The foundation can be laid at a depth of 0.7 m.
Sandy soils are significantly compacted under load, well pass water and slightly freeze through, in such soils, foundations are laid at a depth of 0.7 m (with sufficient layer thickness and sand size up to 25 mm). 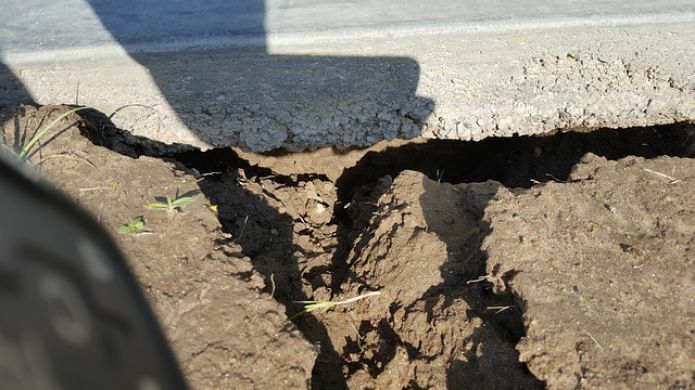 Clay soils are well eroded, and, freezing, swell significantly, the foundation in clay soils should be laid below the depth of frost penetration by 25 cm. Loams and sandy loams are a mixture of sand and clay. Loams contain up to 20% clay, sandy loam up to 10%. Loess soils are loams, they are significantly compressed. The depth of foundations in such soils is determined by the depth of their freezing: in sandy loams and loam the foundation is laid (in moist soils) below the freezing depth, in loess soils 25 cm below the freezing depth (with a thoroughly wired base from water). When viewed from the outside, loess-like soils resemble clayey so they are often confused with them. Therefore, when they are found at shallow depths of clay, loam or sandy loam, it is necessary to carefully check whether they are not loesslike. Loess-like soils can serve as a foundation base if measures are taken against moistening the bottom of the foundation. The depth of soil freezing affects the depth of the foundation; as the soil under the influence of temperature and humidity varies in volume. The maximum depth at which the soil can change in volume and swell, is called the depth of frost penetration. When building a house, it is not enough to take into account only the ground draft from the mass of the house’s structures and the depth of its freezing. The influence of outside temperatures must also be taken into account. Below are data on the depth of soil freezing in various areas. Clay soils swell particularly strongly, since, due to their low water permeability, the water does not find a way out during freezing and expands, with the result that the clay swells. Swelling is much less in sandy soils, and quite coarse in coarse sands, so they can be neglected in practice. The bottom of the foundation should be located below the depth of frost penetration: 10 cm in sandy soils, and 25 cm in clayey soils. The depth of the foundation in dry gravel and coarse sandy soils that allow water to pass when a thick layer of rock is thicker than that. 1 m may be less than the depth of frost penetration indicated above. The foundations of stone houses under the external walls in these soils can be laid at a depth of at least 1 m, wooden - 0.5 m, the minimum depth of the internal foundations under the walls (regardless of the depth of soil freezing) is taken 0.5 m.
When constructing the foundation, it is also necessary to take into account the level of groundwater occurrence. Since they heat the foundations and make it difficult to carry out the work. When building a house, these waters cause great trouble to the developer, so before building a house on such soils, it is necessary to drain the site for construction, to drain, to drain the groundwater, along the existing slope of the site. Artificial bases are made in weak soils under heavy loads on the base of the foundation. Typically, such a base is suitable, as already noted, compacted soil compaction with bedding with rubble or using a sand pillow. Provided that the sand cushions do not have great depth, compaction it and then do not require coarse sand or gravel, their compaction is layered. Before building a foundation, you need to know the stronger the foundation, the more durable the construction. Lowering the foundation into the soil under the influence of overhead loads is called foundation subsidence. Much more often, the bearing area of ​​the foundations under construction, especially tape, significantly exceeds the calculated and non-subsurface soils, almost always ensuring their stable condition. It is based on the forces of frost heaving. The strength of the ice cream bundle reaches 100 ~ 150 kPa (10-15 tf / m2), which leads to the fact that these forces often exceed the loads of the upstream structures. At the same time, the seasonal vertical displacements of the surface layer of the soil, when it freezes by 1–1.5 m, are 10–15 cm. Probably many noticed a leaning porch, not exactly standing extensions and verandas, and often the walls of houses are sometimes even covered with cracks - in most cases it is the result of the action of frost heaving forces. If the construction of the building is conducted on weak soil and has heavy walls, they make columnar foundations. 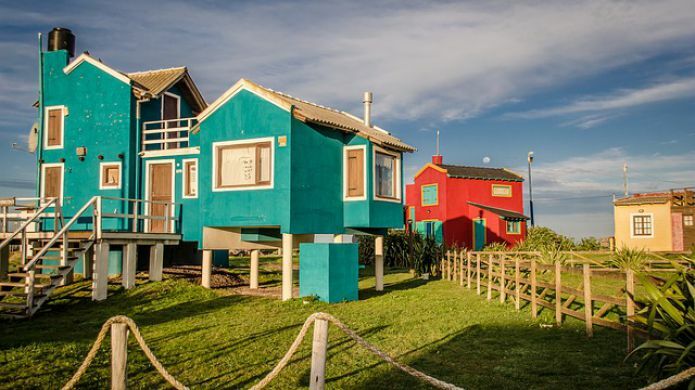 In order to avoid subsidence, the footing area of ​​the foundation is checked by calculation, and if necessary, increased: in the strip foundation, the lower part is made wider, and during the construction of columnar, the distance between the columns is reduced. In fig. 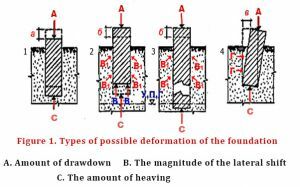 1 shows common examples of possible deformations of foundations arising from improper construction. A big mistake of many private developers, is the confidence that the deeper the foundation lies, the better it is, and that in this case will ensure its reliable operation and resistance to stress. But also, it is necessary to take into account other nuances present during the construction of the foundation. When the lower part of the foundation (sole) is located below the ground freezing level, the frost heave forces no longer act on the foundation from below, but the tangential frost heave forces will continue to act, these forces acting on the side surfaces can squeeze the foundation together with the frozen ground or even tearing off its upper part from the bottom, if the soil is not homogeneous, distortion or even fracture of the foundation can occur. This usually occurs during the construction of foundations made of brick or stone, as well as small blocks, a large role in this is played not by the load of the foundation, therefore leaving the foundation for strength building for the winter, you need to remember the forces of frost heaving, and if possible load the foundation with ballast to the moment of construction above the standing structure. The bottom of the foundation must be located below the level of soil freezing and thereby eliminating the pressure of forces from the bottom. In contrast to the tangential forces of frost heaving acting on the lateral surfaces of the foundation, the foundation is reinforced during construction with the help of reinforcement, which creates a framework rigidly connecting the foundation. In its shape, the foundation is made tapering to the upper part, and the lower sole is made wider than the foundation itself, which contributes to the resistance of the foundation during frost heaving and will not allow these forces to push out the foundation. These measures will ensure the normal operation of the foundation for any vertical ground movement, but it must be remembered that the most optimal material for laying foundation on heaving soils is concrete with reinforcement reinforcement. An important factor in the fight against frost heaving forces that diminish their influence can be: Applying a waterproofing layer to the side walls that wakes up to slide, well, and most importantly, it is eliminating the cause of soil freezing around the foundation, insulating the surface layer around the foundation (Expanded polystyrene, slag) the measure does not hurt shallow foundations. When building on hilly terrain, it is necessary to take into account the lateral pressure of the soil, its possible shift. The magnitude of this pressure may depend on many reasons (the steepness of the slope, the hydrogeological composition of the soil, etc.) And it is difficult to calculate. Under these conditions, columnar foundations connected between the pillars by reinforced concrete (grillage) did not badly prove themselves. Reliable work and strip foundations, rigidly connected in the longitudinal and transverse directions (reinforced concrete). Depending on the type of soil, the type of foundation is also chosen, since the foundation can be stationary (fixed) or floating (mobile). When building small houses, in most cases a stationary foundation is used. Floating foundation - suit on heaving soils, the property of which is variable depending on moisture saturation and temperature. Structurally, the floating foundation is a monolithic or grid plate, the thickness of which is calculated based on the weight of the future structure. The construction of such a foundation can be justified in the construction of simple and small structural structures on it. Belt and column foundations - are the most common stationary foundations. For labor costs and materials costs, they are 2-3 times, and if necessary, deep bookmarks are 3-5 times more economical than a strip foundation.Pillar foundation is indispensable when building on deep freezing heaving soils. The use of a columnar foundation on weakly-bearing soil in the construction of houses with heavy walls is limited, since there is a need to manufacture a "grillage" and fill the space between the pillars with soil and a grillage, the so-called (zabirka). During the construction of the tape foundation, the basement smoothly passes into the walls, and the load from the walls is evenly distributed throughout the foundation, and therefore the strip foundation is able to carry heavy walls and floors, the possibility of positioning the basement or the underground is also a big plus.It is advisable to build a strip foundation with a not deep foundation on non-refractory dry soils. Laying the strip foundation in the case of deeply freezing soils requires a lot of labor and is not economically profitable. The foundation on screw piles - this type of foundation has proven itself on problem soils, where the construction of traditional types of foundations is very labor-intensive and not financially viable. Screw piles are widely used when constructing the foundation on peats with a large depth and other subsurface soils. Это стальная труба со сварным лезвием определенной конфигурации на конце. Винтовые сваи могут быть установлены как вручную, так и механически. The pile is screwed into the ground due to the presence of the blade to the solid base, the blade in turn, has the function of the sole preventing subsidence after installation. After installation of the piles along the perimeter, a metal channel lining is arranged to prevent vertical movement of the piles. Installation of the foundation on piles is not labor-intensive and fast, it is worth noting that the installation does not disrupt the structure of the adjacent soil. You can install screw piles on almost any soil, except rocky and pebble-like soils. The coating protects the piles from corrosion, provides steel resistance to moisture and humidity. After installation of screw piles, the hollow pipe is filled with concrete, which gives it additional strength. In the United States, almost all the buildings are made on a reinforced concrete slab, because almost everywhere is a good and stable ground. Concrete tape, of course, is cheaper than the slab, but under it you need to make a quality litter of fine gravel and sand, and the slab is less critical, since it has a large area of contact with the ground.